Professor Geo Potts immigrated from Newcastle (England) to South Africa in 1905 to take up the position as lecturer at Grey University College (GUC), now named University of the Free State. In 1906, some 29 students enrolled at the university and the staff comprised of 10 lecturers. Geo Potts was one of them and was head of three departments namely: Geology (1905 - 1909), Zoology (1905 - 1912) and Botany (1905 - 1937). Potts collected plants mainly in the Free State and Lesotho. The plant specimens he collected formed the basis of the University's herbarium, which bears his name. Potts published several research papers such as "The plant succession in the Orange Free State, and the need for maintaining a covering of vegetation" in 1923 and "An ecologic study of a piece of Karroo-like vegetation near Bloemfontein" in 1927, the year he was also promoted to Professor. Several plants were even named after him such as: Delosperma pottsii (L. Bol.) L. Bol., Puccinia potts Doidge and Gymnostomum potts (Dix.) Sim. Professor Potts lectured in Botany and acted as head of the department for 32 years. In about 100 years of existance, Geo Potts Herbarium had grown from approximately 2 600 specimens (collected by Geo Potts himself) to 25 000 specimens. The most important collectors that attributed to this number of specimens is indicated in the table below. Most specimens were collected in the Free State (12 770), Kwazulu-Natal (3 000), Western Cape (2 700), Eastern Cape (1 500) and Northern Cape (1 500). Included in this collection is special collections from: De Hoop Nature Reserve (Western Cape), Hogsback (Eastern Cape), Okovango Delta (Botswana) and Marion Island. 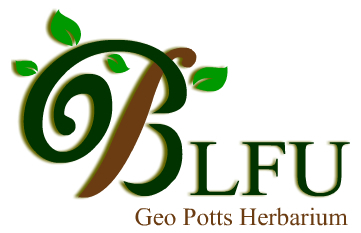 This online database provides access to herbarium specimen data at the BLFU herbarium in the Free State, South Africa. The online service is now being developed and new data will be uploaded as these become available. Locality information on rare or endangered species may be restricted online. Contact the Herbarium Curator or Herbarium assistant for information.